[By Nick] If you recall in my last review, I said I wouldn't spend anymore of my money on a pint of Jeni's. Thankfully, I have friends who randomly show up to my apartment bearing frozen treats. To be honest, I've actually wanted to try this flavor ever since Jeni's posted a video last year on just how it's made. Nothing makes me happier than scratch made, hand torched marshmallows. Just look at that video and tell me you don't feel all warm and fuzzy on the inside. Wait, just me? This is what the single life does to you I guess... on to more important business than my love life. First off, the sweet potato base doesn't scream sweet potato at all. With the amount of spices they use, I'd have a hard time telling the difference from this and a pumpkin base. That said, it's still delicious. The spices lean towards being cinnamon heavy but it doesn't overpower everything. The consistency is just what you'd expect. 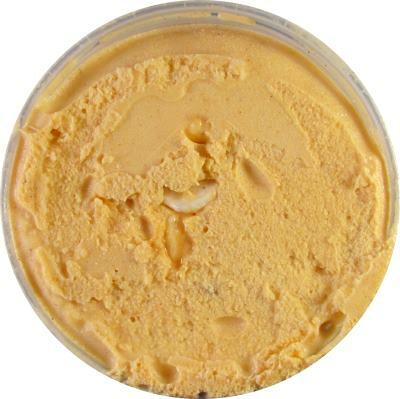 A nice thick, super premium ice cream with a creamy and smooth factor that rivals most gelatos. The torched marshmallows are pillowy squares of delight. Their flavor seems to have a bit of cinnamon to it as well which is different. I'm not sure if it's from being submerged in the ice cream but I truly enjoy it. They don't have much of a torched quality in taste or texture though. They're more like a normal marshmallow you'd find in a rocky road which is disappointing to me. That's not the only place where they fall short. It seems to be a common theme for me with Jeni's pints that I get one that's not distributed properly. There are a decent amount of the marshmallows in the pint to keep me satisfied, it's their placement on the other hand that bugs me. As you can tell, the marshmallows are concentrated to the middle of the pint. While the base can holds its own for sure, I do find the outer portions lacking as a whole when they are missing the mix-ins. Now time for my time to complain (Dubba: rant) about their pricing (Dubba: again). Is this a unique flavor, in description yes but not in taste. There are far more cinnamon flavors that I prefer to this one. Do the handmade torched marshmallows blow my mind? Not even close. While I enjoy the cinnamon flavor and pillowy texture, that's not what I want from torched marshmallows. 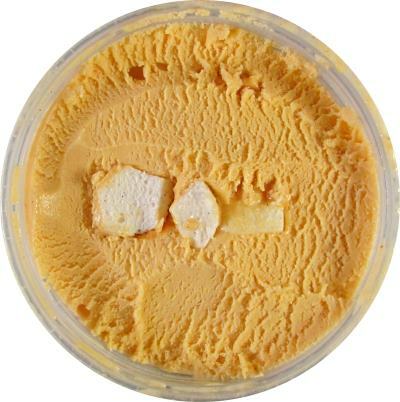 I want what I got from The Gelato Fiasco and their gooey, toasted marshmallows‎. I understand Jeni's has a loyal following but when you eat as much ice cream as I do, the pricing will never make sense from a business perspective. If I can find a similar flavor being produced at the same level or better for cheaper, why would I spend over $10 for a pint of Jeni's? If you see this in stores and money isn't a factor or you want to treat yourself for the holidays, go for it. I just can't recommend this to the mass public or as a repeat purchase when there are better flavors on the market. 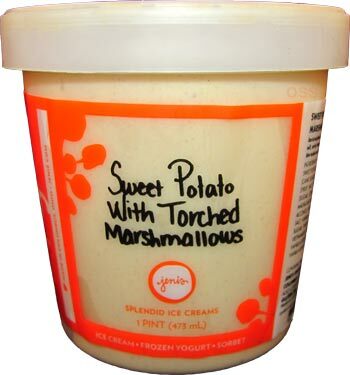 Thankfully I have thoughtful friends who know my stance with Jeni's and are nice enough to make the purchase for me. A better idea would be a torched marshmallow swirl. Why they couldn't torch the marshmallow fluff then "swirl" in the ice cream. Have some cinnamon crunch in there as a strudel. I still don't get why in the world Jeni's would charge high price for ice cream? I saw the video and it seems I could had done similar process except for the marshmallows. I would had taken marshmallow fluff and bruleed it lightly and fold it. Danielle, I have the worst luck with Jeni's and their mix-ins. Anon #1, I think you're aiming for a a sweet potato casserole flavor. not a bad idea though. Anon #2, I don't either and I shall rant about it until I get a real answer. It's so frustrating to me when other companies do the same business practices and charge less for a superior product. Jeni's has so many flavors i want to try but I'm just not willing to spend that much on average-good ice cream. It has to be downright amazing to warrant that price. I agree with your point with Jeni's. They never give you any free coupons? Sweet potato casserole would be a better idea. I noticed that myself and I feel that Jeni's is wanting more $. Their labels are hand written which is a nice touch but not good enough. Anon, nope never received anything from them. Just donations from local stores when they took me on tours of their new shops. Even if they did give me free stuff, I'd still have to comment on the price. As for the hand writing, Steve's does the same thing and business practices yet offer a better product for around $5 a pint near me. The price is why I bought her cookbook. Now I can make them without paying ridiculous prices. When I moved to Ohio I thought I would try a pint and then saw how much it was and promptly said hell no.